As one of the largest and most well-known online dating sites in the world, it's no surprise that Match.com is responsible for more dates, relationships and marriages than any of its competitors. What enables Match.com to stand out among its competitors is that it provides you with both powerful search technology and 5 daily match suggestions based on shared background or interests. Match.com is also one of a handful of online dating sites that offers convenient online dating via cell phone so that you can search for a partner at your convenience everywhere you go. "First Impressions" - having your profile emailed directly to new members to provide them with a sense of Match.com's members. This can drastically increase the amount of interest in your profile. Match.com offers a plethora of search options so that you can identify potential matches based on the criteria that are important to you. The site offers keyword searching as well as customized searching, through which you can narrow down your options based on qualities like marital status, political views, salary range, astrological sign or even eye color. 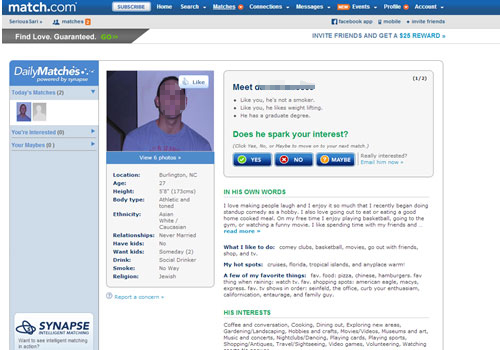 In 2011 the company changed its search algorithm to help identify matches based upon each user's previous searches on the information provided in his or her profile, since the company's data indicates that singles actually tend to search with a more open mind than they have when recording their preferences during registration. Search based on which users are online locally. This service will help you find relevant people near you and will also lead you directly to profiles that are still active. Searching by those who are online in your area will also allow you to chat immediately with anyone you are interested in. Reverse Matching - With this search feature you can check out profiles of singles looking for people like you. Mutual Matching - In this section you can find people who provided a similar answer to the "About my Date" section. Match.com presents each profile in a clear, concise way and also tells you which aspects of your profile are compatible with the member that you're interested in. 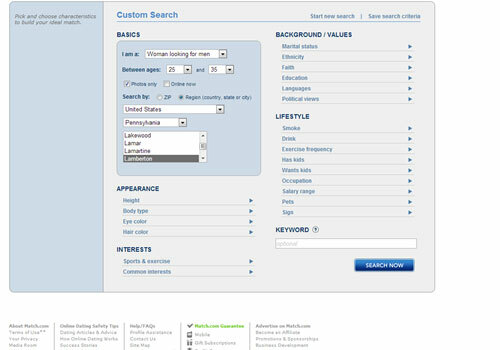 Match.com also enables you to sort your search results in a couple different styles so that you can view your options in the most useful way. You may choose from the "detailed" view or the "gallery" view. Search the Match.com database for users looking for a match with your characteristics. Check out profiles of singles looking for people like you. Finally, Match.com offers you a comprehensive My Match section, in which you'll see suggestions based on multiple criteria. The Daily 5 offers recommendations of 5 potential matches based on various qualities that you have in common. You should be aware that you may not always receive a Daily 5 suggestion (or, in some cases, you may just receive a Daily 3), if Match.com's algorithm does not find an ideal candidate for you. The Mutual Match option presents potential partners based on stated preferences that you and your match suggestions have in common. Like at First Site offers match suggestions based upon your answers about first impressions in the registration quiz, and the Singled Out feature offers highly-targeted matches based upon computer algorithms that suggest you and a potential match have an especially high likelihood of liking each other in person. 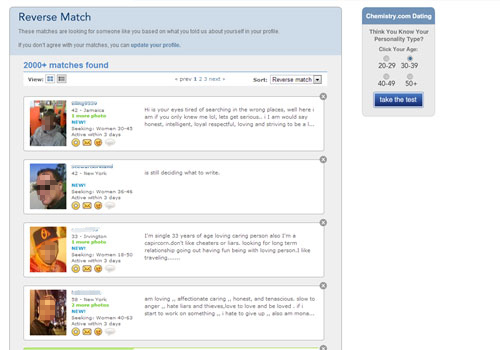 The last section of creating a Match.com profile is the In My Own Words section that asks you to describe yourself and your ideal match in 4000 characters or less and to provide a headline for your profile. Unlike compatibility matching services that require you to answer every question in the registration questionnaire, Match.com allows you to skip questions or to choose 'no answer'. Upon completion of the questionnaire, you will be asked to upload a photo. You can also email Match.com your photo if you have trouble uploading it. When your registration is complete you will be asked to send it for review, and once it has been approved by the customer care team, Match.com will make your profile searchable on its database. This process can take up to 24 hours, but often takes much less. Although most online dating sites offer customer service by email only, Match.com offers both email and phone support. I called the customer care center on a Sunday afternoon at 2:35pm EST and received an immediate answer. I didn't even wait a minute before a customer service representative came to the phone. He was both friendly and helpful and knew the answers to all of my questions. Customers can also contact help services through email by submitting a form on the website. As a Christian professional black woman, we are always told that it is hard to find a professional black man. Well I was matched with a great guy, and now we have been married for almost a year. We are happily married; we are very blessed. Having access to so many features was really helpfully since I'm new at this and didn't know exactly which features I would need. I have been a member for four months. I have found some men I E-mailed but they either did not get back to me or they were not interested. I am getting too many men who are not at all within my travel distance, theirs either. I am 60 yrs. old but look much younger. I think you have better luck if you are younger, but I am not giving up yet. I tried all the other sites before and always had bad luck! Match led me to my soul mate! I recommend this site to every single and looking person I know. It's affordable and so worth it!! Mixed experience but the best overall. I met many quality people over the couse of 2 years but did not meet my match. Then I noticed a new member. I sent him a message, we met for lunch and it was true love. That was 5 years ago. We have been married for the past 3 years and are living a dream I never thought possible. I found match to be fun and really easy to use. I just signed up this past weekend and already met a great guy that lives 10 minutes away. I've met so many guys through match it's been great. Going on a third date with really nice guy tonight. It was an easy to use website with a lot of interesting people on there. I will definitely be back on the website again. I still think is a great site. Belonged for over a year. Easy to use, lots of matches. Quality of matches were not high enough... too many obese women, or women lying about their age, old pics, etc. I met more friends and compatible mates on this site than on e-harmony. I spend 3 months on both. One the other side, computer date sites are still not really for me.